2015 Ford Mustang will have a Burnout Button! Post subject: 2015 Ford Mustang will have a Burnout Button! There have been quite a few headlines regarding the new 2015 Ford Mustang in the past week, but one that's got people buzzing is about a new secret feature that Ford won't talk about yet. We'd speculated that the feature would have to do with executing burnouts after being tipped to the possibility by Gary Gastelu at Fox News. While our sources have refused to comment about specific features on the record, we've been able to confirm that one of the secret features in the 2015 Mustang will indeed be an electronic system that will help drivers execute the perfect, smoky, epic burnout. Think launch control for burnouts. Our sources haven't given us any clues as to how the system might operate, but there are several possible routes to deliver the functionality. One way would be to enable a line lock on the front brakes, while simultaneously disabling traction control, with or without a rev-limiter to get the engine speed up to the ideal for a clutch dump and subsequent smoky burnout. We can already see some of you cringing at the thought of the electronic aid in performing your burnouts, and, we suspect that like launch control systems, the burnout feature can be disabled to let you roast your tires the old fashioned way, too. The 2015 Ford Mustang is shaping up to have a long list of high-tech features. 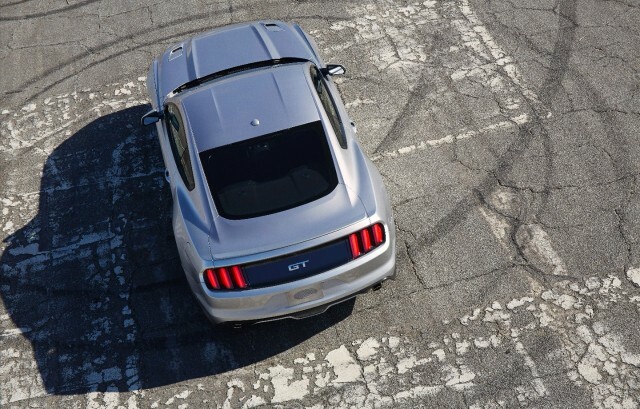 From independent rear suspension to new technology features such as adaptive cruise control and blind spot monitoring, this is sure to be the most advanced, and civilized Mustang to date. Whether the new burnout function is the only secret feature the new 2015 Ford Mustang will offer remains to be seen, but we can't wait to slide behind the wheel and see how this new system works for ourselves. Until then, we'd suggest you listen to what the new Mustang GT sounds like, because frankly, it just sounds ballsy. Post subject: Re: 2015 Ford Mustang will have a Burnout Button! How do I get this button installed on my vn? So what happens when a component fails due to utilizing the "burnout button" on new cars under warranty? Sort of a cool feature, but not practical for a production car. Besides, a massive stand still isn't what us aussies consider a burnout (assuming the front brakes lock on). So no more d bangers? Yes, of course, that is definitely what you buy a performance sports car for, so you do stupid s**t like burnouts... mmm I must remember that. Mustangs have had burnouts done in them since the dawn of time. It goes back to their drag racing heritage. If I had the cash and desire to own one of the new Mustangs I would most likely light it up leaving the dealership when I picked it up. Its disappointing but that people need electronic gadgets nowdays to pull a brakejob.